ISIS is making it clear that it now has its eyes set on the Gaza Strip. By calling on Palestinians to rebel against Hamas, ISIS is hoping to facilitate its mission of infiltrating the Gaza Strip. Ongoing attempts by ISIS to infiltrate the Palestinian area should worry not only Palestinians, but Israel and Egypt as well. If ISIS manages to get a toehold in the Gaza Strip, they will be that much closer to Israel's doorstep, with their jihadis minutes from Israeli towns and cities. For the Egyptians, this means that one day they will have to fight ISIS not only in the Sinai, but also inside the Gaza Strip. The biggest losers, once again: the Palestinians. There is nothing more delightful than watching two Islamic terror groups fight each other to the death. For several years now, Hamas in the Gaza Strip and ISIS in Sinai have been cooperating with each other, especially in smuggling weapons and terrorists over the border between Egypt and the Gaza Strip. It was a win-win: Hamas supplied ISIS with terrorists; ISIS supplied Hamas with weapons that were smuggled into the Gaza Strip. It appears, however, that the honeymoon between the two terror groups is over. Last week, ISIS published a video documenting the execution of one of its men after he was found guilty of smuggling weapons to Hamas in the Gaza Strip. The execution of Musa Abu Zmat, a former Hamas terrorist who fled the Gaza Strip to join ISIS, took place in Sinai. A screenshot from the ISIS video, showing Musa Abu Zmat, a former Hamas terrorist, blindfolded and awaiting execution. In the video, the ISIS terrorists accuse Abu Zmat of being an "apostate" for smuggling weapons to Hamas's armed wing, Ezaddin Al-Qassam, in Gaza. They also accuse Abu Zmat of smuggling dozens of people from Al-Arish, in the Sinai, into the Gaza Strip. 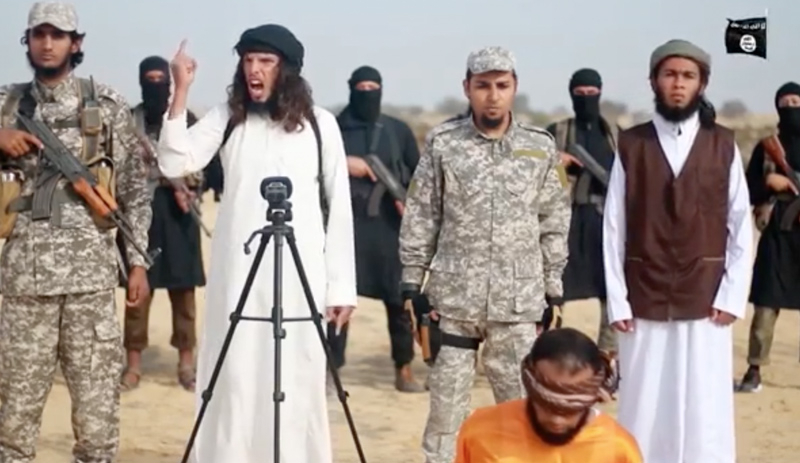 The ISIS terrorist who carried out the execution by a single shot to the head has been identified as Mohammed Al-Dajni, who is also from the Gaza Strip but fled to Sinai to join ISIS. Al-Dajni's father, Abu Rashed, is a senior Hamas official who previously held a top position in the health services in the Gaza Strip. Another ISIS operative who appeared in the execution video has been identified as Abu Kathem Al-Makdisi. In the video, Al-Makdisi is referred to as a "sharia judge." 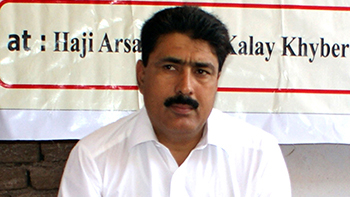 He is the one who read out verdict against Abu Zmat before the execution. Al-Makdisi also condemns Hamas in the video and calls on Palestinians in the Gaza Strip to join ISIS. Palestinian sources say that Al-Makdisi's real name is Hamzeh Al-Zamli, a convicted thief who fled the Gaza Strip several years ago. The sources note that he had been convicted of robbing several businesses in Gaza before he crossed the border to Sinai. The families of the two ISIS executioners (Al-Dajni and Al-Makdisi) have issued strong statements condemning and disowning their sons. There are many Palestinians from the Gaza Strip who have joined ISIS in the past few years. It is worth noting that ISIS and its affiliates in Sinai have carried out many atrocities against Egyptian civilians and the Egyptian army. Many of the Palestinians who have been joining ISIS are former members of Hamas and Palestinian Islamic Jihad. Some even held senior positions in the armed wings of those two terror groups. The business of smuggling weapons and terrorists across the border between the Gaza Strip and Egypt has flourished for many years. Until recently, ISIS and Hamas were in full cooperation on the smuggling business and this has undoubtedly facilitated some of the major terror attacks carried out by ISIS in Sinai in recent years. ISIS is making it clear that it now has its eyes set on the Gaza Strip. By calling on Palestinians to rebel against Hamas, ISIS is hoping to facilitate its mission of infiltrating the Gaza Strip. Previous attempts by ISIS to infiltrate the Gaza Strip have been successfully thwarted by Hamas. Hamas brooks no competition. Ever. It shows that despite its denials, Hamas is involved in smuggling weapons from Sinai into the Gaza Strip. The man who was executed by ISIS last week was accused of smuggling weapons for Hamas's military wing inside the Gaza Strip. This means that he was either a double agent (for Hamas and ISIS) or that he did something to annoy his ISIS cohorts. Hamas has repeatedly assured the Egyptian authorities that it has no links to ISIS in Sinai and that it supports Egypt's war on terrorism. This is quite a statement from a terror group. The Egyptian authorities have taken the claim with a grain of salt and continue to impose a blockade on the Gaza Strip by keeping the Rafah border crossing shut. To be clear: the latest dispute between Hamas and ISIS is not a power struggle between good guys and bad guys. This is a power struggle between bad guys and bad guys. It is a power struggle between two ruthless Islamic jihadi terror groups who even have much in common regarding strategy and ideology. Both groups want to spread sharia and eliminate the "infidels" and "apostates." Both groups are responsible for some of the most horrific terror attacks and atrocities in modern history. While Hamas is probably the lesser of the evils in this instance, it is far from moderate. Ironically, it is probably Hamas's cooperation with ISIS that has brought Hamas to its current level of deterioration. Hamas wanted help from ISIS to smuggle weapons into the Gaza Strip and they got it. Hamas, in return, allowed ISIS terrorists to cross back and forth into the Gaza Strip and Sinai. For now, no one knows where this ISIS-Hamas feud is headed. What is certain is that the ongoing attempts by ISIS to infiltrate the Palestinian arena should worry not only Palestinians, but Israel and Egypt as well. If ISIS manages to get a toehold in the Gaza Strip, they will be that much closer to Israel's doorstep, and their jihadis minutes from Israeli towns and cities. For the Egyptians, this means that one day they will have to fight ISIS not only in the Sinai, but also inside the Gaza Strip. The biggest losers, once again: the Palestinians. The sooner all these Muslim Psychopaths kill each other off the better for Israel and the world will be. It is so sad that a land as precious as the Holy Land is forever embroiled in such violence and bloodshed. And yes I blame the cult that is Islam. It has given the world nothing but war and bloodshed since it's creation. No good God would hold human suffering and murder as something holy. Though some claim differently, that is not the God of Abraham and Jesus. Out of 1300 years not one single year without slaughter and blood letting. Yet many still call it "One of the three great religions?" Utter nonsense. Tribal people are mostly loyal to their own tribe. It is no different with radical Muslims tribes, who have a history of killing each other, besides us 'kafirs'. It will be good news if they wipe each other off the face of the earth, but that is not likely to happen because they breed so prolifically, while Westerners are busy annihilating themselves through unsustainable birthrates. It is all cause for grief. Boy! When it comes to hate, nobody does it better than Muslims. They are the champs. Of course not all Muslims are haters, but there are more than enough bad actors among them to spread their acrimony around the world several times. It's fitting that they should end up fighting each other and leaving the rest of us alone. So, bring it on boys! Let's see which branch of your religion has God on its side. And maybe you'll find out that God doesn't favor either army. A revealing article. It is akin to describing how strychnine can dilute arsenic. I'm glad others have expressed delight at the prospect of mutual annihilation for both ISIS and Hamas. I thought that too, then I was ashamed of that feeling. There are probably more than a few innocent people living there----you know, some of the people the current and recent batches of gangsters have used for human shields for their (semi-)guided missile launchers---who will now have machine-gun mob wars on their streets. Gee it's looking like even Egypt might admit that it screwed up when it got Israel to give them back the Sinai, they appear to be neither particularly interested in nor particularly capable of eradicating the threat there. I give the average working folks trying just to get by more credit than these two factions or versions of trouble. They are tired of living like refugees on the land they occupy. How does some rag tag criminal enterprise intend to improve the lives of the average person by re-introducing another rag tag criminal enterprise into Gaza? Improving the lives of the Palestinians has never been on the agenda of the PA or Hamas or Hizbollah or ISIS. Their single target is to throw the Jews into the sea, while the Jews feed them, give them water and electricity and take them into their hospitals, among other things. Years ago I was asked by a World Bank Official, "what happened to all the money donated by international institutions to the Palestinians?" I respond "why do you ask me, I was an official with USDA, asked Arafat? The leaders of the Palestinians have stolen money left and right, with Mercedez, gold jingling from their women and apartments in Paris or Switzerland, while the refugees languish in camps and in Arab countries without rights and political influence. So, improving lives, has yet to become a priority whether in Gaza or the West Bank. The old question arises "what have the Palestinians done to deserve this." I would add that the summary execution of the "apostate" would appear to be humane, I have seen their enlightened recruiting motivational tapes released in the Islamic world which has them slow burning to death captured enemies usually after prolonged torture. I have to wonder what the significance of a single shot to the back of the head communicates? They let him have a gentler, quicker death than they deal out to most they execute. There is a missing player in this story. We've been told that the PA of Abbas and Hamas have been trying to figure out a way to work together in Gaza. That would make this struggle a 3-way conflict. PA vs ISIS vs Hamas. Many of the people in Gaza would prefer Israel to take over again, as they have lost jobs that Israelis provided. I know of at least one request for Israelis to return to Gaza. But Israel does not want to rule over Muslims. There must be found a way for Israel to provide sovereignty and security while the people govern themselves internally. something like an emirate scenario. Have we not tried that for over seventy years. It's obvious that fighters didn't fight in Syria and Iraq. They would have learned their lesson. People are numb now about videos. Hard to out do the videos that came out of Iraq. That is the problem. Islamic, Arabic peoples do not govern themselves in the same way as Western countries because they do not want the same things and do not have the same values. Unlike the West their values are rooted in tribalism and Islam, neither of which is inclined to tolerance. There is no way that a Jewish country could hold sovereignty over these people to any good effect. The West does not have the will nor the understanding among its political leaders. There is no option but to let them fight it out among themselves and try to contain the fight within territorial borders. Isis and those in the Gaza strip deserve each other. At least when they commit more atrocities against Israel the Israeli jets can wipe out the terrorists all in one go. Will the EU be donating aid to isis now as well as the Palestinians in Gaza ? Hamas and ISIS are two cheeks of the same stinking arse. Watching them kill each other is indeed a pleasure. I'm sure Mohammed would have approved. ISIS intent on yet another murder spree! I doubt the Israelis will tolerate much from ISIS at all. In fact, it will probably be the Israelis that shows the world how ISIS should be dealt with. At least they have the courage to put up a fight against the murdering Muslims who think that no other person except a Muslim should walk the earth. Of course, the Wests politicians will quickly condemn the Israelis for defending their people and country because they can't or won't protect their people from the Muslims carrying out attacks on innocent folk in the countries where Muslims are now living in Europe and the US. They will do anything to deflect attention from themselves for not having the courage to say no to Muslim demands within Europe's towns and cities. In fact, the majority have shown immense cowardice and even allowed Sharia law to creep into the laws of the land. There are some Western politicians who actually admire the Islamic religion the culture that comes with it, and they even don't care that women don't have the same rights as men! These are the treacherous politicians of course, they are the ones that will hopefully be voted out of office when next there are elections. The West has relied a great deal on Israel to act as a buffer in the middle east, yet even so, they will be the first to condemn Israel if a confrontation takes place. Where Muslims are concerned, Western politicians seem to see them as the persecuted and not how they should be seen, as the aggressors they really are. "the West's politicians will quickly condemn the Israelis for defending their people and country"
I believe there is a new sheriff in town. His name is Trump. Israel might even get military support if they need it. It's about time The Arab spring came to Gaza and Ramallah too. Let's relax and enjoy enemies of Israel killing each other for a change.